Described by Terence Conran as 'the Leonardo da Vinci of our times', Thomas Hetherwick is an inventor, designer and artist. From his London studio has come some of the most recognisable, surprising, innovative and creative design work of the 21 century so far, from furniture and Christmas cards to buildings, bridges and a new bus for London. It's hard to say at what point exactly when, but at some point during the opening ceremony for the 2012 Olympic Games in London, cynicism miraculously transformed into national pride. 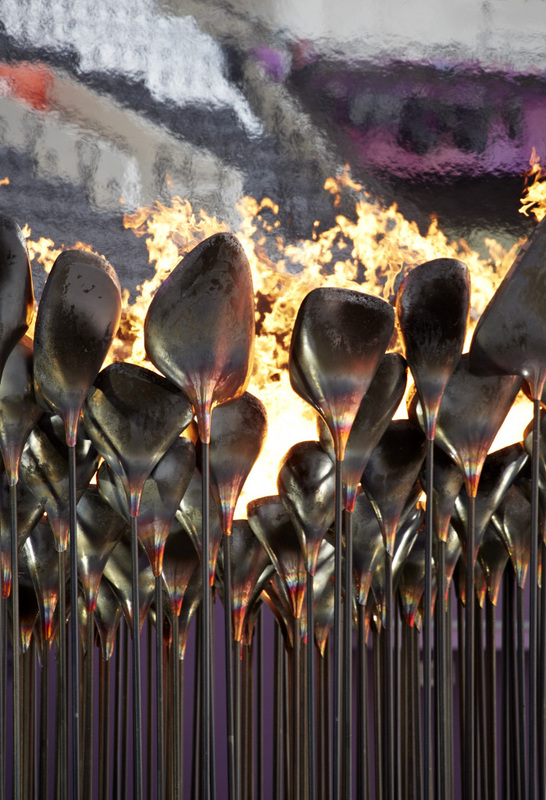 At the centre of the Olympic Stadium was Thomas Heatherwick's Olympic cauldron, which was made up of 204 copper cone-shaped objects, each of which had been brought into the arena by an athlete representative of each country and placed on a corresponding metal rod which radiated out from the exact centre of the stadium. Athletes then ignited flames inside each one. Breaking with recent tradition, Hertherwick placed the cauldron in the centre of the stadium, rather than on the roof. 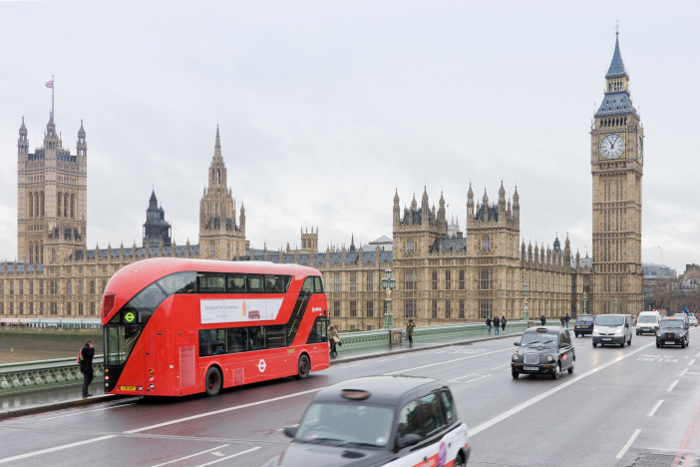 Reinterpreting London's truly iconic Routemaster bus for the 21 century would surely be a challenge for any designer. Adding to the pressure was the fact that this was the first new bus commissioned for the capital in 50 years. The finished design, with its wrap-around windows and hop-on-off platform at the back is a clear nod to the classic design of the original Routemaster, but also manages to be strikingly modern in both look and function. Heathwick explains: 'Even though it had been much loved, the brief was not to replicate the Routemaster, which had been inaccessible to wheelchair users and difficult for people with prams. 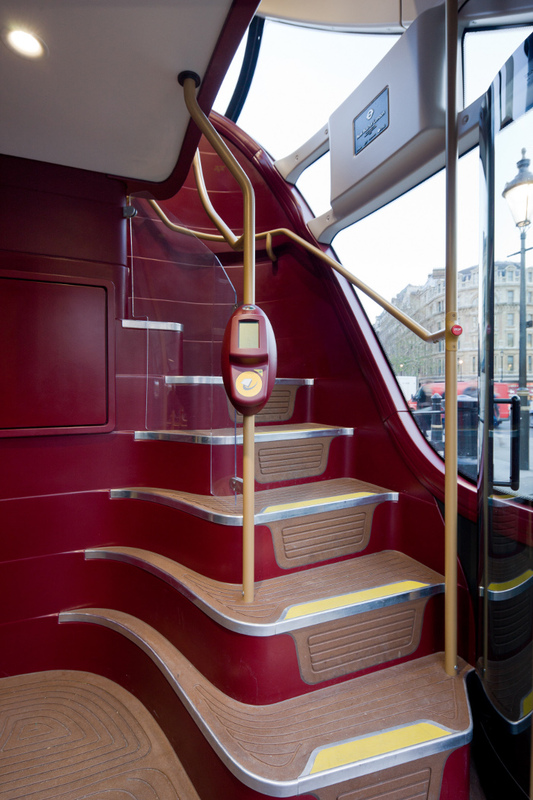 To make the new bus easily accessible, while also minimising the time it would spend at bus stops, heatherwick and his design team decided to give the bus three doors - one at the front, near the driver, one in the middle and another one, with a platform like the original Routemaster, at the back. The bus is powered by both electric and diesel energy and is designed to be light-weight so that is uses 40 per cent less fuel than standard London busses. In October 2013, Thomas Heatherwick attended a party to celebrate the relaunch and redesign of Blueprint magazine where he spoke to DeignCurial about his career and the British and world design scene. Watch our video here. 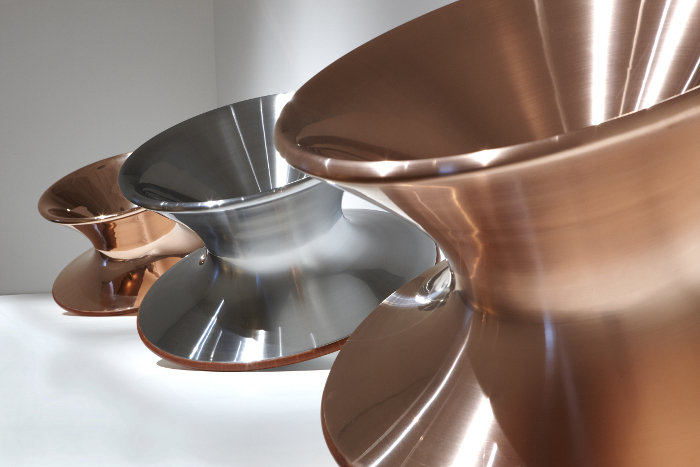 Fascinated by the making process, Heatherwick had toyed with idea of making furniture using the factory process of squeezing heated metal through a shaped hole, known as a die, to produce straight aluminium lengths with a precisely shaped cross-section. 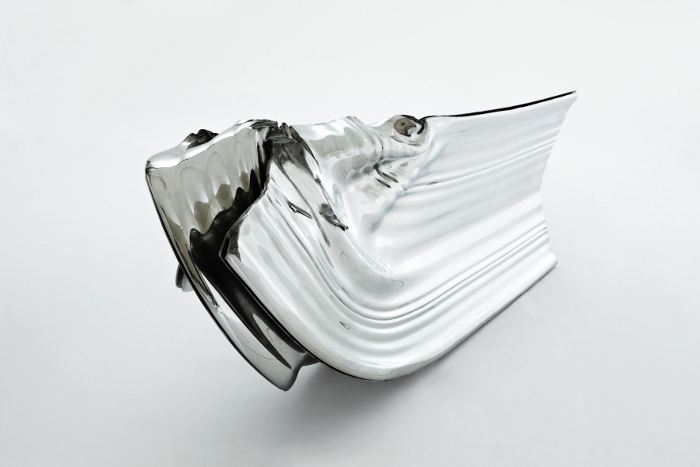 Heatherwick had noticed that when the first part of the metal was squeezed through the die it often snagged and contorted, producing random shapes that could often be beautiful because of their individual imperfections. After years of research, the studio found a factory in the Far East with a suitable machine and used it to create a range of 'extruded' aluminium furniture, including benches whose straight, clean, extruded lengths contras with their raw, contorted ends. 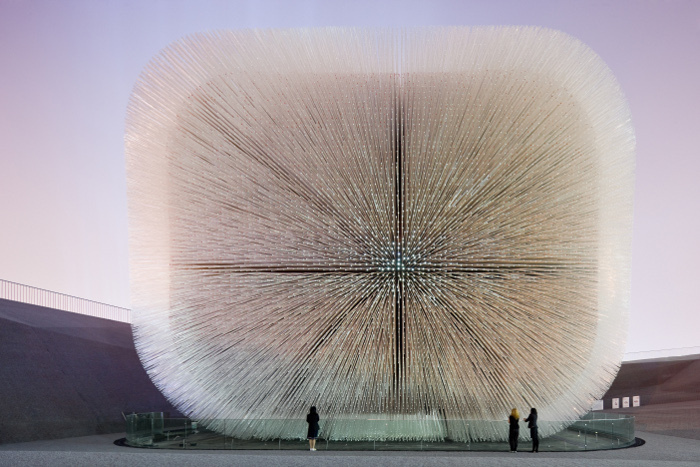 Winner of the RIBA Lubetkin Prize for the most outstanding work of international architecture by a RIBA member, Hertherwick's Seed Cathedral, part of the British Pavilion at the Shanghai Expo in 2010, also featured on the front cover of Blueprint magazine. 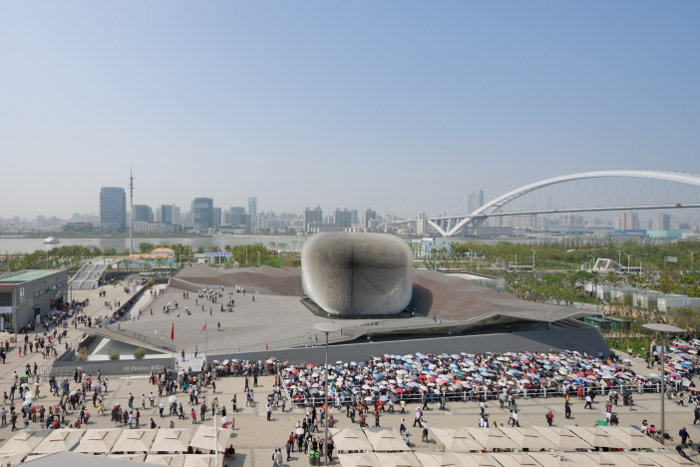 The pavilion, a cube-shaped structure whose surface resembled shimmering hairs, was made of 60,000 transparent and slender acrylic-tipped aluminum rods, each 7.5 meters long. Each strand has a 'seed' embedded in its tip. These rods are suspended in a timber frame, which sits on a landscaped area designed to look like a creased piece of paper. The long rods, which quiver in the breeze, evoke the feeling of a dandelion or a sea urchin. The interior is quiet and illuminated by the daylight that filters past each seed through each optical hair. Heatherwick says he designed the pavilion with three objectives in mind: to be a pavilion whose architecture is a direct manifestation of the content it exhibits; to provide significant public open space in which visitors could relax; and to find a simple idea that is strong enough to stand out among the hundreds of competing pavilions. The process of metal-spinning - which involves pressing flat sheets of metal against a shaped former while they both rotate - is traditionally used to make circular metal objects, such as timpani drums and gas cylinders. 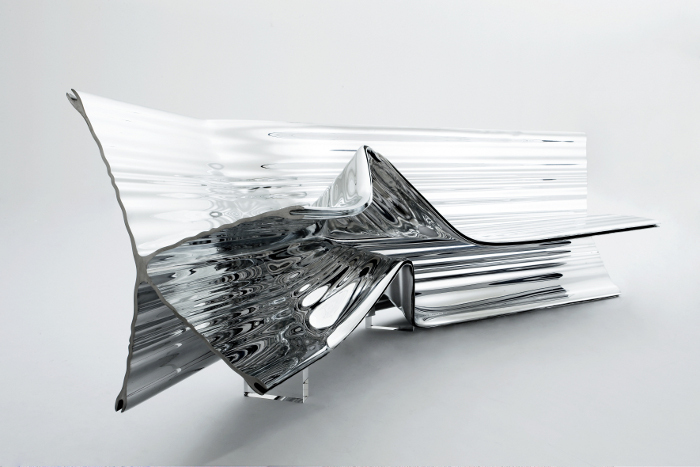 Heatherwick wondered if the same process could be used to create a chair. But could it also be comfortable so sit in? After extensive research and experimentation the studio produced an ergonomic form that worked as a chair, whichever way it is rotated. 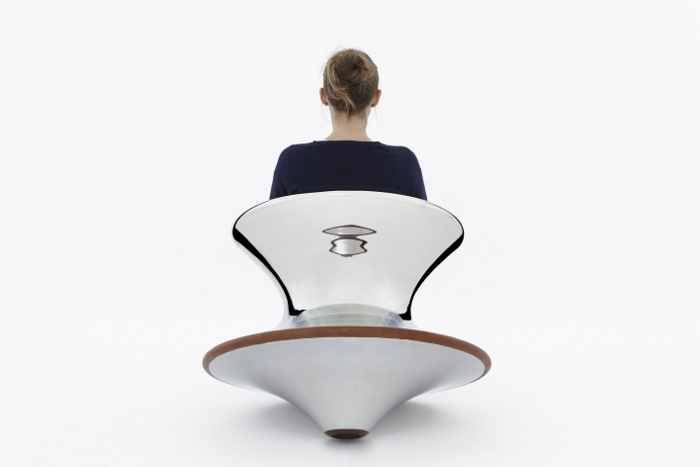 To achieve this in a single form, the seat had to be capable of serving as a back support and the back support had to make a comfortable seat. 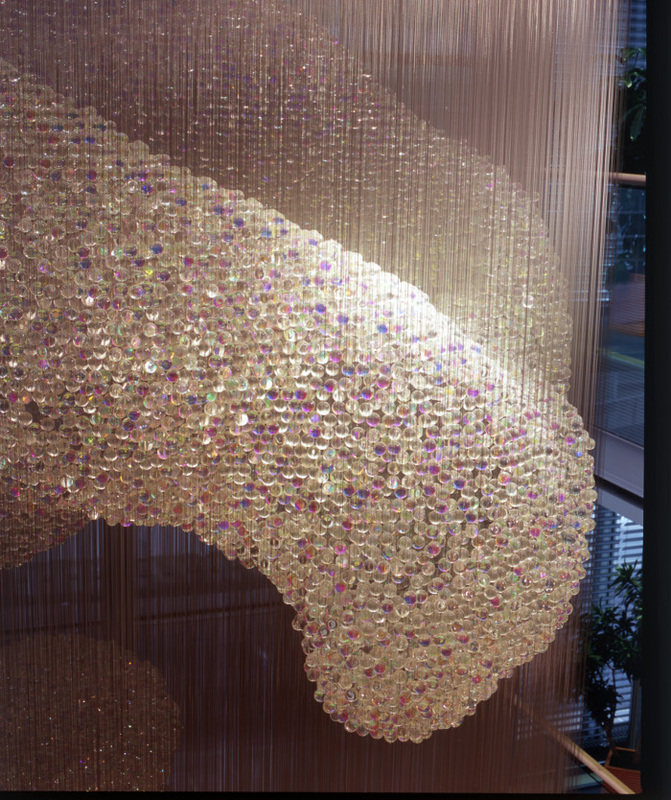 Most of Heatherwick's projects begin with a problem or a question, and this chandelier, designed for the London offices of biomedical research charity Wellcome Trust was no different. The chandelier was to occupy an eight-storey atrium in the building, but the snag was that it would also have to fit through a standard-sized door. Taking inspiration from a pool of water in the atrium, Heatherwick began the project by pouring drops of molten metal into water to create complex and unique shapes. 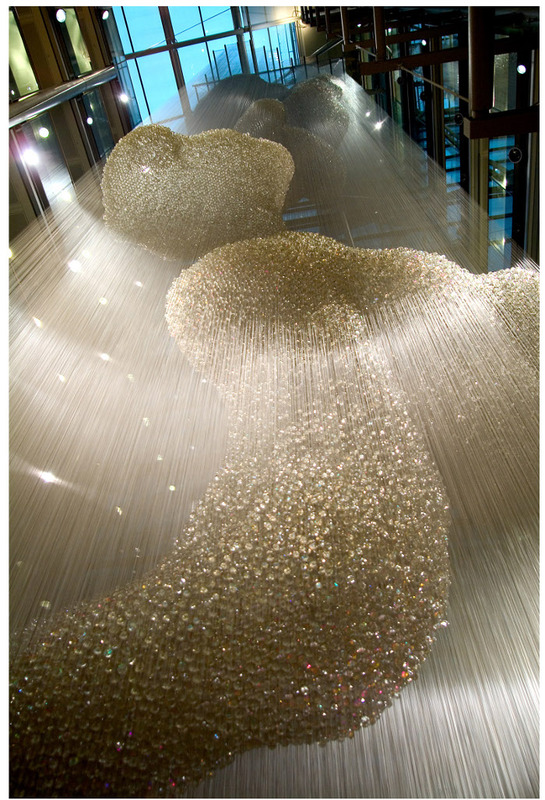 The studio then chose a single one of these droplets whose shape they liked and created142,000 exact replicas in glass. 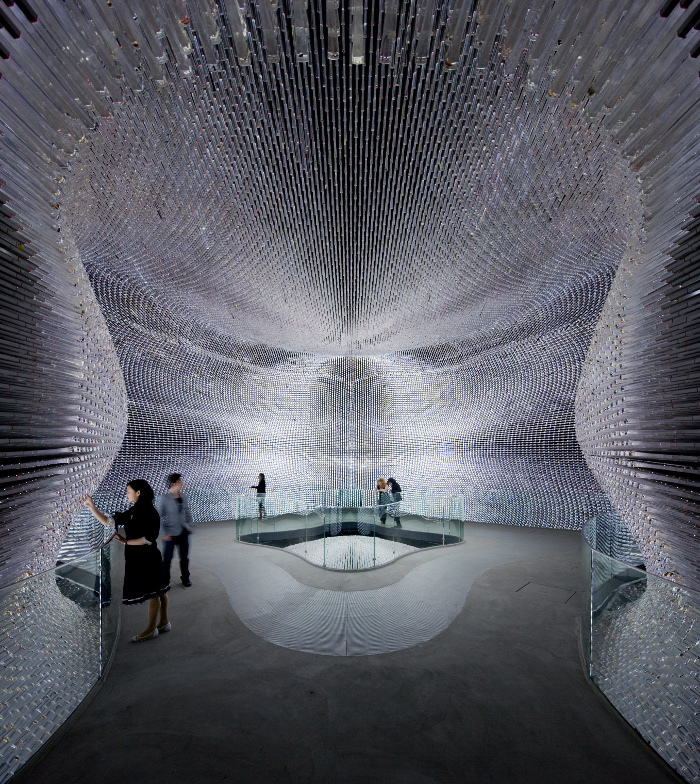 These droplets were then suspended on 27,000 high-tensile steel wires. 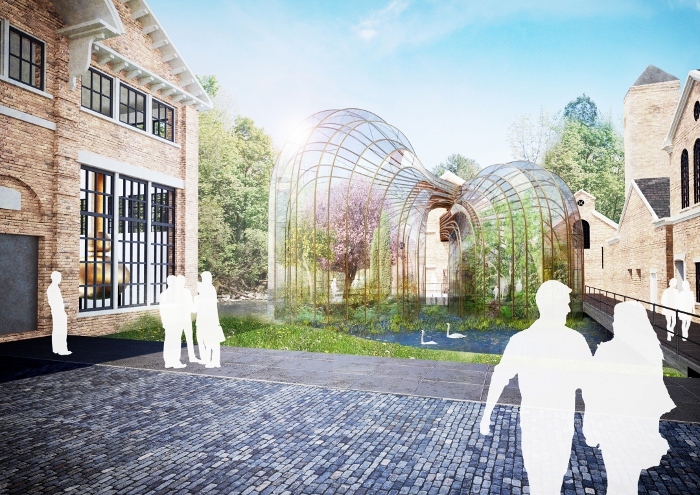 Having won a prize, awarded by British gin-maker Bombay Sapphire, for a glass bridge design, Heatherwick Studio was commissioned to design the company's new distillery and visitor centre too. The site is in Laverstoke in Hampshire, an area chosen for its proximity to the River Test. 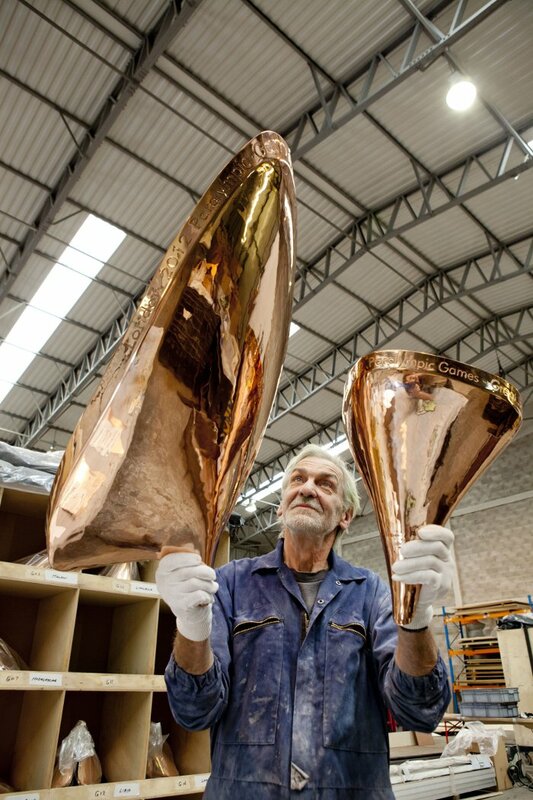 Instead of creating a visitor centre per se, the studio decided to make the actual production process, involving a 200 year-old copper gin still, visible to the public. The studio also designed a green house in which can be grown the 10 herbs and botanicals - including liquorice root and coriander seed - that are used to flavour the gin. Two new glass houses emerge from the main production building and sit within the water of the widened river. 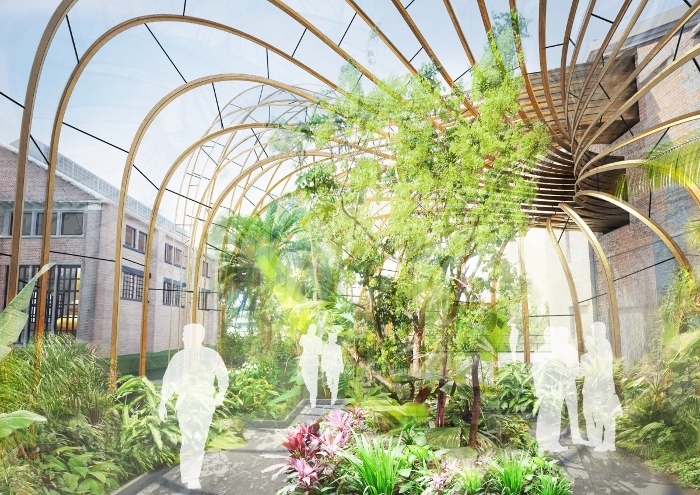 One of the glass houses contains a humid environment perfect for growing plants that originate in tropical climates, while the other is a dry, temperate zone in which the Mediterranean spices grow. 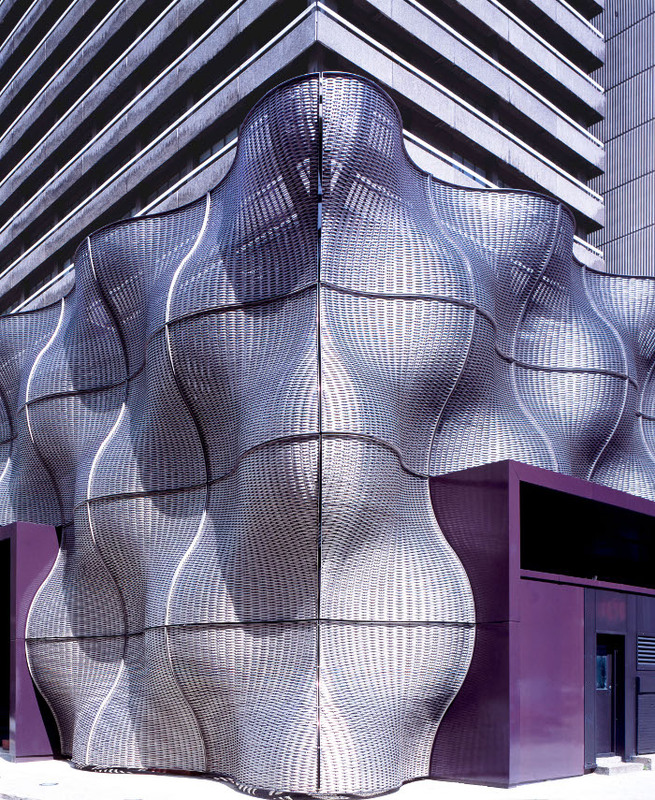 In 2005, Heatherwick studio was asked to improve access to the hospital, making the approach look better and function more effectively. Completed in 2007, the scheme made several positive changes for the benefit of patients, visitors and staff. Much of the scheme consists of functional, pragmatic moves, which create space for a focal point, in this instance provided by Boiler Suit - a bespoke tiled cladding system wrapping around the building's boiler house. Boiler Suit was fabricated from high grade stainless steel frames, with braid woven through as the 'warp'. The 108 tiles are geometrically identical, with 17 variants required to accommodate specific junctions. The tiles are a secondary facade system that is demountable and allows the machinery to vent through, while framed reveals shade the large windows on the south facade to reduce solar gain. In 2007, the project won the Building Better Healthcare Award for Public Space, and the FX Magazine, Judge's Special Award at the FX Awards. 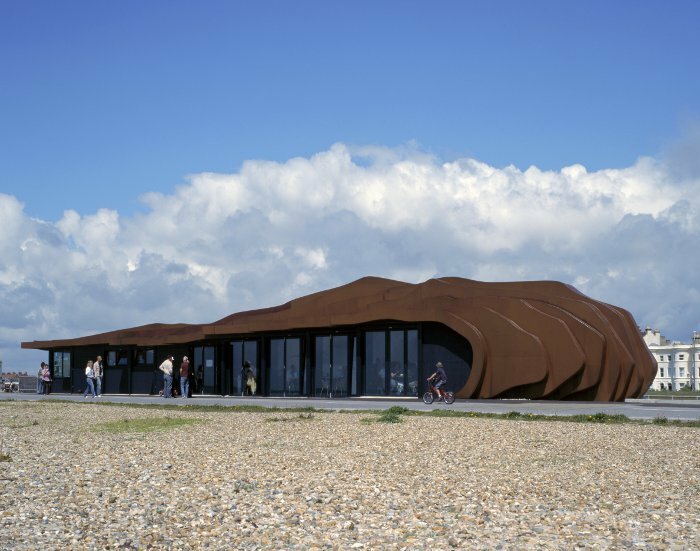 As bold a reinvention of the British seaside 'caff' as you're ever likely to see, Heatherwick's East Beach Café in Littlehampton on the south coast of England, deliberately bucks the architectural trend of deigning new buildings that are 'in keeping' with those around them. Instead, Hertherwick and his design team decided to make the café more in keeping with the beach than the row of Georgian buildings nearby. 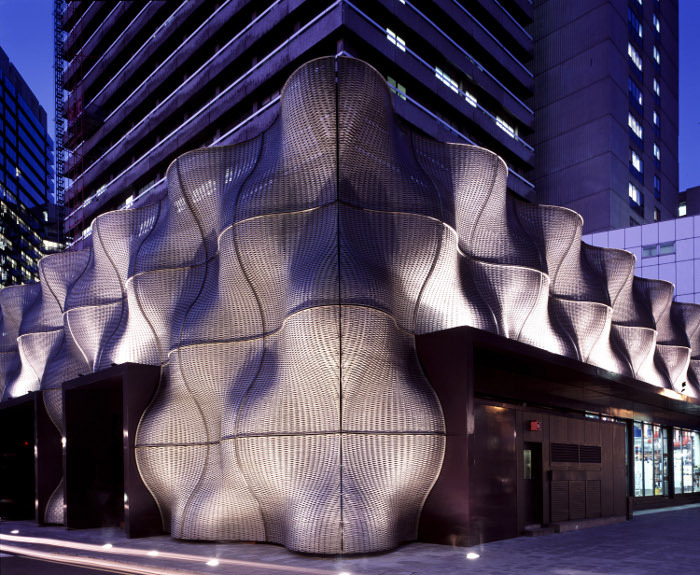 The entire structure is built or ribbons of weathered raw steel which are welded together to form a shape something like a contour model on its side. 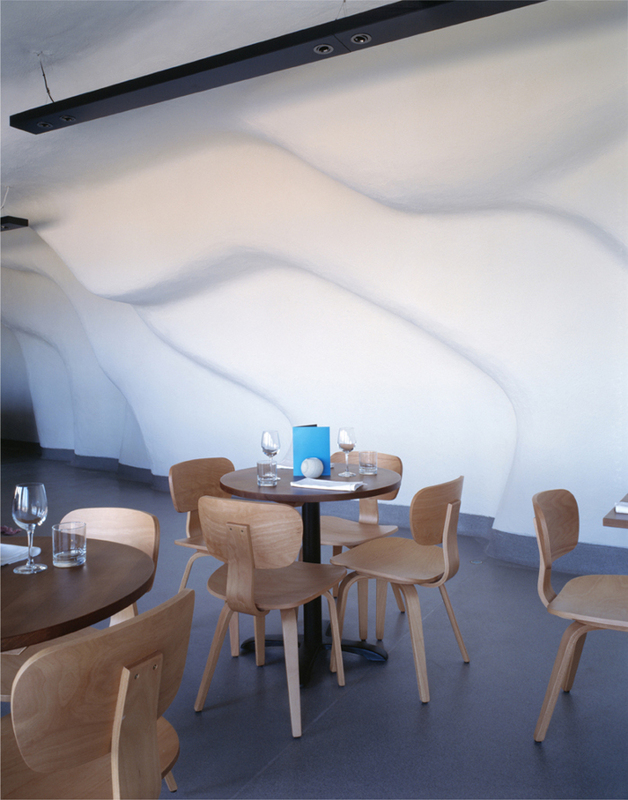 The design also cleverly conceals roller shutters, which cover the windows when the café is closed. 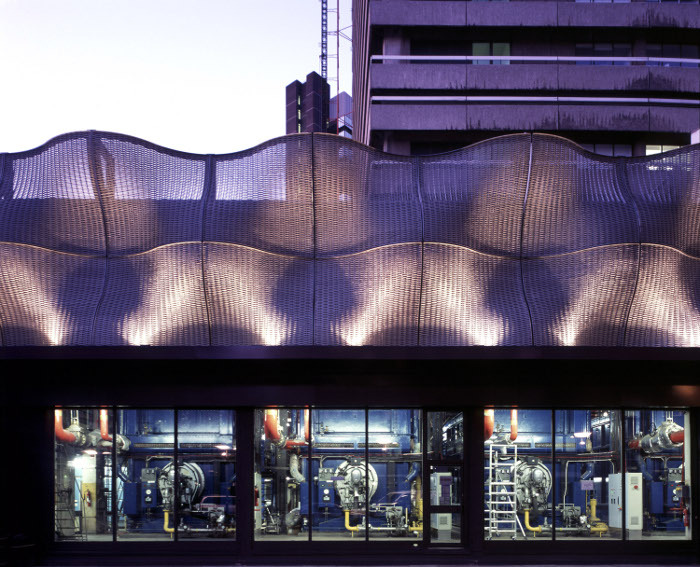 Putting such a modern building in such a traditional and quintessentially English surrounding may seem controversial, but Heatherwick says the planning application was granted without a single letter of objection, a fact he partly attributes to the enthusiasm of the café owner who commissioned him.